October 1992: Doctor Who has now been off the TV screens for three years, although there are persistent rumours of a film or new series in the pipeline, and plans are afoot for a 30th anniversary special, The Dark Dimension. The BBC has also embarked on the biggest series of repeats since 1982’s Five Faces season, with one story from each Doctor (and two for Pertwee) airing on BBC2 between January 1992 and May 1993. At this stage in ‘the Wilderness Years’, then, the show is still on terrestrial TV, and people are actively planning to get a new series, movie or at least a straight-to-video special made. And rather than playing it safe during this period of uncertainty, sticking with the familiar TV team of the seventh Doctor and Ace, Virgin decides to radically overhaul the New Adventures, exiting one of the lead characters and replacing her with a new, novels-only companion. Professor Bernice Summerfield must surely be the most important Doctor Who character never to have appeared on TV – having appeared in 22 years and growing of novels, audios, comic strips and short stories. She is by far the New Adventures‘ most significant addition to the canon, and in many ways is the reason why the Big Finish audios exist. When Looms, and the Other and the Adjudicators are barely-remembered footnotes, Bernice is still a living, breathing part of Doctor Who continuity. Not least because she went on to appear in 45 of the remaining 52 New Adventures, making her the most prolific companion to date. Partly this is because she arrives at precisely the right moment, when Virgin has done pretty much all it can with the Season 25/26 TV set-up. 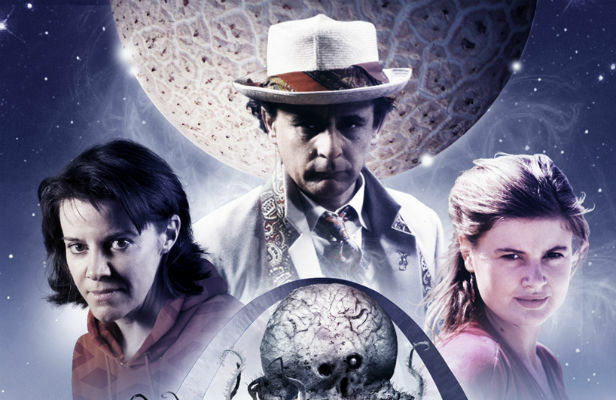 In Love and War, the Doctor and Ace join up with a band of space travellers on the cemetery planet Heaven, where they have to battle an attempt by the fungal Hoothi to infest the dead and conquer all of time and space. As usual, the Doctor has allowed his tendency for secretive forward planning to override his better judgement. As the story unfolds Ace falls in love with one of the travellers. This threatens to drive a wedge between the two of them that could drive them apart forever. Yadda yadda yadda. We’ve seen the same basic scenario playing out in various permutations since Remembrance of the Daleks – most recently in Mark Gatiss’ first Doctor Who story, Nightshade – and we know exactly how it pans out. Ace is furious with the Doctor, he makes a halting, heartfelt apology. Ace gets over it and they saunter off into the bushes. Paul Cornell’s genius is to take this plot, and make it really matter in a way no-one has before. This time, the Doctor really does go too far. Ace really is heartbroken. Their split really does seem permanent. This seems necessary – in the TV series all the Doctor’s tests were supposed to be leading up to Ace becoming a Time Lady, a kind of baptism of fire that would prove she had what it took to go to the Gallifrey Academy. In retrospect this has a slight whiff of patronising paternalism about it (and notably, Cartmel and Aaronovitch changed it when they came to write the ‘Season 27 Lost Stories’ 20 years later). Instead, Cornell punishes the Doctor for his presumption. His manipulation is not ok, the end doesn’t justify the means, and he can’t just use his friends as pawns. Love and War is the kind of self-correction that the TV series occasionally did (cf. Steven in The Massacre or Tegan in Resurrection of the Daleks), but followed through to a more devastating conclusion. That’s where Bernice comes in – at this Doctor’s lowest moment, when he’s saved the universe but lost his best friend. Like Donna Noble 15 years later, she’s brittle and spiky, refusing to be patronised or manipulated. Like Donna, at the moment when the Doctor is at risk of losing himself completely, she reminds him of who he is, and why he fights. And like Donna, she buries the angst under layers of fun. No wonder readers embraced her. Love and War is Virgin’s most important novel. Not only because it’s a better pay-off to the Doctor and Ace’s relationship than the planned Season 27, but because it enabled the books to free themselves from the constraints of the TV series and genuinely go off to tell stories ‘too broad and too deep’ for the small screen. Next Time: ‘I don’t suppose there’s a need for a doctor any more. Make me a warrior now’ Ace returns – in Deceit.